U.S. Army Garrison Rheinland-Pfalz activated with its headquarters in Kaiserslautern, Germany, on Oct. 1, 2013. The garrison logo represents the unit's establishment as a brigade-level garrison with a large geographic area. 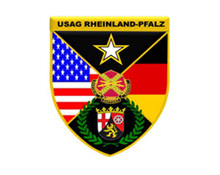 Each element of the crest was carefully selected to illustrate this new beginning and the partnership between the American and German communities in the state of Rheinland-Pfalz.